File Under: Coolest Yo-Yo That never got made. While searching through some of my old yo-yo photos this morning, I came across these pics of a Bumble Bee GT molded out of a soft white rubber material. I’m not sure who took the photos, but I believe it was Tom Van Dan Elzen that emailed them to me (so presumably he took them). 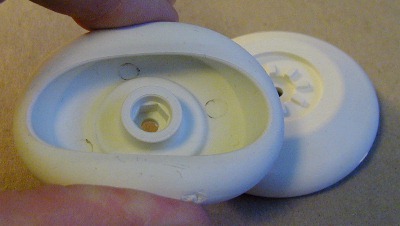 The concept is awesome, a rubber yo-yo with no plastic or metal hubs. Just a simple one piece design with room for a brake pad and spacers. Of course the yo-yo had a major flaw though… when spinning it would just go crazy. The centrifugal force would pull the rubber shells in crazy directions making the yo-yo wobble at first, then it would just totally lose control and go unstable. 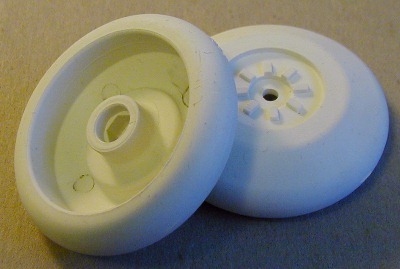 To this day, I don’t think anyone has successfully built a yo-yo with a rubber hub. The closest thing would be Yomega’s Crossfire yo-yo (video of squishy hubs here). But of course the Rubber Bumble Bee GT was a very simple design and the Crossfire was equipped with like 16 pieces. You know, I’m not sure it would not work because of the very design of the Bee.